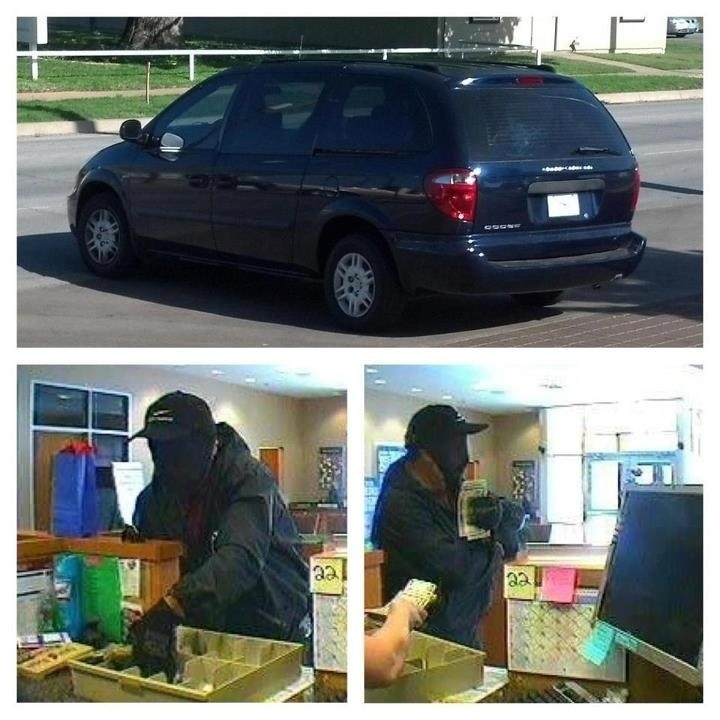 Arlington PD is Seeking public’s help in identifying a bank robbery suspect. On Monday, April 29, 2013 at around 5:30 p.m., a suspect walked into a bank located in the 200 block of N. Mesquite Street and pointed a handgun at bank employees and demanded money. The suspect obtained an undisclosed amount of cash, left the bank on foot and entered a vehicle parked nearby. Investigators believe this suspect is responsible for several other recent bank robberies across the Metroplex and is referred to as the “Mesh Mask Bandit.” He is described as approximately 35-40 years of age, 5’8” to 5’10” tall, average/muscular build, with a thick mustache or goatee. In Monday’s robbery, the suspect was wearing dark pants, a dark-colored hooded jacket, a black baseball cap, and a black mesh “wave cap” or “stocking” over his face. The suspect vehicle is described as an early to mid-2000 model, navy blue Dodge Caravan, displaying a paper license plate. A dye pack included with the cash is believed to have deployed as the suspect got to his vehicle. The vehicle may have red dye stains on the driver’s side of the van. The suspect may also have possible dye and burns on his body. Photographs of the suspect and the suspect’s vehicle are attached. This suspect should be considered armed and dangerous. Do not approach the suspect. Anyone with information on this offense or other similar robberies is asked to call Arlington Police Detective Brian Dunn at 817-459-5729 or Crime Stoppers 817-469-TIPS (8477). All tipsters can remain anonymous and are eligible for a reward of up to $1,000.